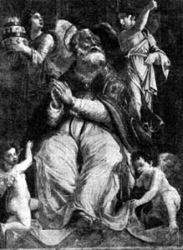 Raised in a pious family; his father was a priest in Rome, Italy and Damasus served for a time as deacon in his father's church, Saint Laurence. Priest. Assistant to Pope Liberius. Chosen 37th pope in a disputed election in which a minority chose the anti-pope Ursinus. The two reigned simultaneously in Rome which eventually led to violence between their supporters and false accusations of Damasus having committed a crime. His pontificate suffered from the rise of Arianism, and from several schisms including break-away groups in Antioch, Constantinople, Sardinia, and Rome. However, it was during Damasus's reign that Christianity was declared the religion of the Roman state. He enforced the 370 edict of Emperor Valentinian controlling gifts to prelates, and opposed Arianism and Apollinarianism. He supported the 374 council of Rome which decreed the valid books of the Bible, and the Grand Council of Constantinople in 381 which condemned Arianism. Economic patron of his secretary, Saint Jerome, commissioning him to make the translation of scripture now known as the Vulgate. Damasus restored catacombs, shrines, and the tombs of martyrs, and wrote poetry and metrical inscriptions about and dedicated to martyrs. They state that he would like to be buried in the catacombs with the early martyrs, but that the presence of one of his lowly status would profane such an august place. Ten of his letters, personal and pontifical, have survived. Daughter of Luis Pidal y Mon and Cristina Chico de Guzman y Munoz, the Marquess and Marchioness of Pidal; her father was Spanish ambassador to the Vatican and a very active supporter of the Church. She was baptized at the age of eight days, Confirmed in 1896, made her first Communion in 1902, grew up in a pious family, was known as an intelligent and religious child, and early perceived a call to religious life. She entered the Carmelite novitiate at El Escorial, Madrid, Spain in 1920. On 19 May 1924 Maria and three sisters founded a house at Cerro de los Angeles, Madrid, the geographical center of Spain, and she took her final vows there on 30 May 1924. Prioress of the house in 1926. The house expanded so quickly that Mother Marvillas was sent to found another in Kottayam, India, which over the years has expanded to many other Carmels in that country. She returned to Spain, and in 1936, as part of the anti-clerical actions of the Spanish Civil War, she and her sisters were arrested, relocated to Madrid, and subjected to fourteen months of house arrest and harassment. In September 1937 Mother Maravillas and her community relocated to las Batuecas, Salamanca, Spain where they founded a new house. In 1939 she led a group of sisters to restore the house at Cerro de los Angeles. From there she led an expansion of the Carmelites with houses in Mancera de Abajo, Salamanca in 1944, Duruelo, Avíla in 1947, Cabrera, Salamanca 1950, Arenas de San Pedro, Avíla in 1954, San Calixto, Córdoba in 1956, Aravaca, Madrid in 1958, Talavera de la Reina, Toledo c.1960, la Aldeheula, Madrid in 1961, and Montemar-Torremolinos, Málaga in 1964. To unite these and other far-flung houses, she founded the Association of Saint Teresa in 1972. The Carmel in la Aldeheula was hugely expanded with schools, a community of houses for the local poor, church, community halls and other structures in what effectively became a small town. Studied at Saint Omer and at the Royal College of Saint Alban, Valladolid, Spain. Ordained in Salamanca, Spain in 1618. Joined the Franciscans in 1618. Worked in Douai and Gravelines in France, and Brussels, Belgium. He returned to England to minister to covert Catholics in 1634. Arrested and condemned to death for the crime of being a priest. Martyr. Monk at Samosata on the Upper Euphrates River at the age of twelve. When chosen abbot by his brothers, he declined. He made two trips to learn from Saint Simeon Stylites the Elder, and received that saint's blessing. Would-be pilgrim to the Holy Lands, but a vision of Saint Simeon caused him to travel instead to Constantinople where he spent the rest of his life. At age 42, Daniel decided to become a pillar-dwelling hermit like Simeon, and spent the next thirty-three years on one. Daniel lived on a series of pillars built for him by Emperor Leo I and other wealthy supporters, living in the open weather, standing each day until he collapsed. Ordained by Saint Gennadius. Many came to learn from the holy man, sitting at the foot of the pillar as he preached, celebrated Mass, gave spiritual counsel, and healed the sick who were taken up to his platform. Counsellor to Emperor Leo, Emperor Zeno, and the Patriarch of Constantinople; prophesied some of the political turmoil in which Zeno was involved. Daniel came down from his pillar only once - to convince Emperor Baliscus to abandon the Monophysite heresy. Studied in Paris, France. Benedictine Cistercian monk at Clairvaux Abbey in 1131; spiritual student of Saint Bernard of Clairvaux who accepted David after he had been initially rejected due to health problems. Assigned by Saint Bernard to found and lead the Himmerod Abbey, Trier, Germany in 1134. Miracle worker, healer, exorcist with the gift of prophecy. Born to the Italian nobility. Spent a dissolute youth as a soldier in Italy. Near Sartiano, Italy he was blinded, and offered to change his life if he was healed; he was healed. Pilgrim to Rome, Bari and Loreto in Italy. Having heard the preaching of Blessed Ambrose Sansedoni in Siena, Italy, he was moved to retire from the world to live as a hermit and do penance for his earlier life. Joined the Carmelites, but continued to live as a hermit. Received visions of Jesus, Mary and the angels; had the gift of prophecy, and was beset by demons. Born to a noted middle class family; his father was later given rank in the noblity. Servite. Studied philosophy and theology in Bologna, Italy. Priest. Renowned for his learning and scholarship. Advisor to Duke Frederick of Montefeltro, Urbino, Italy. Norbertine canon of the monastery in Roggenburg, Swabia, Bavaria (in modern Germany). He was known for his deep prayer life, his personal penances, and his devotion to the Virgin Mary. Promoted pilgrimages to a shrine in nearby Sheissen. In his later years he withdrew to life as a prayerful hermit in a cell in the monastery, spending his life in prayer, spiritual communion and celebrating Mass alone. Norbertine canon of the Averbode monastery near Diest, Brabant (in modern Belgium). Ordained in 1574. Sub-prior of his house and master of novices, he was known for instilling a zeal for the faith in his charges by his pious personal example. Vicar of Hechtel, Limburg, Belgium in 1586 when he was imprisoned by Protestants at war with the Church. Lay woman in the archdiocese of Valencia, Spain. Member of Catholic Action. Martyred in the Spanish Civil War. Bishop of Piacenza, Italy. Friend of Saint Ambrose of Milan, he regularly read and commented on the first draft of Ambrose's writings. Dispatched by Pope Saint Damasus I to Antioch to suppress the Meletian Schism. Attended the Council of Aquileia in 381. Sixth century soldier. Hermit in Wales. Servant to Saint Peris. A cairn on the top of the Llanberis Pass in Wales is known as Corffwysfa Pens (the Resting-Place of Saint Pens), and there are traditions of pilgrimage to the hill to pray for the intercession of Saint Pens. However, no information about him has survived. Commander of the Mercedarian convent of Santa Maria in Burgos, Spain. Noted for his personal piety and his support of the spiritual growth of the friars in his house. Pagan priest who was healed from a serious disease by the prayers of Christians; convert. Martyred in the persecutions of Shapur II. Abbot. Known as a miracle worker. Martyred with twelve of his monks in the persecutions of the Sassanid King Shapur II. Benedictine monk at Saint Saviour Abbey in Redon, Brittany (in modern France). Spiritual student of Saint Convoyon of Redon. Mercedarian friar in the convent of Santa Caterina in Toledo, Spain. Christian deacon. Martyred in the persecutions of Shapur II. Two Christian missionaries and one of their local defenders who faith in the persecutions of governor Rictiovarus - Fuscian, Gentian and Victoricus. Three Christians murdered in the persecutions of Diocletian for giving aid to Christian prisoners - Pontian, Practextatus and Trason.